It is essential that there remains a good stock of blood and plasma products. Anyone of us could need blood at any point; blood transfusions are vital to help us recover from many accidents, operations and treatments. Although the NHS tries to keep 6 days worth of blood – one major incident can put a hefty strain on reserves. Fluctuations in weather, transport and busy times like Christmas can also reduce donations. Yet the need for blood and plasma products remains constant. Hospitals across England need more than 6,000 blood donations every single day. To supply this amount of blood NHS Blood and Transplant need an additional 190,000 new donors to come forward annually. New research from NHS Blood and Transplant shows that 81 per cent of 18-24 year olds have never donated blood and almost half the population of blood donors are aged over 45. 40% fewer new volunteers have come forward to give blood in the last year compared with a decade ago. We now use blood far more efficiently and so don’t need as much as we used to, but we still rely on 190,000 new regular, healthy donors every year in addition to the established donors who have ensured our supply for many years. In particular, the NHS need an additional 40,000 new black donors, particularly for sickle patients, but for any other black patients who are undergoing treatment or surgery which needs blood. The better the blood match the better the chances of success. According to the World Health Organisation, the safest blood donors are voluntary, non-remunerated donors from low-risk populations. Yet these are in short supply. Different countries have different strategies for encouraging blood donations. The US, Germany, Austria, China and some parts of Canada – all pay for blood donations. Italy offers a paid day off in lieu of donation which works well, whilst Germany reimburse expenses. In the UK an NHS drive to encourage a new generation of donors includes Date2Donate films featuring social media stars donating blood. The NHS remain do not offer paid remuneration for donations but do work hard to ensure that donors are amply rewarded with a true feel good factor for their generosity. Everyone is extremely well looked after and thanked for their contribution. You get some lovely emails and a message to say which hospital your donation has gone to. You also get lovely biscuits and the whole process is relaxing and rewarding. Read on to find out why blood is so vital and how it is used to keep people alive. Hospital procedures and operations have become far more efficient in their usage of blood, so we now need less blood than we did a decade ago. However, blood remains a vital ingredient in our treatment of numerous conditions and is also often used in end of care to make the last days more comfortable. However usage varies between hospitals depending on their particular specialties. All blood types are needed daily, but the greatest need will be for the most common blood type. In an emergency, anyone can receive type O red blood cells. Those people with type O blood are known as “universal donors” and their donations are in great demand by our nation’s blood centres. O Rh negative blood is rare but essential because it is the only blood type that can be given to anyone, regardless of their blood type. A rare blood type is any blood type that is difficult to find in the population where you may need that “rare” type of blood. Donors with the blood group B Rh positive are more often found in black and south Asian minority ethnic communities. Similarly, some rare subtypes such as Ro, are more common in black communities. 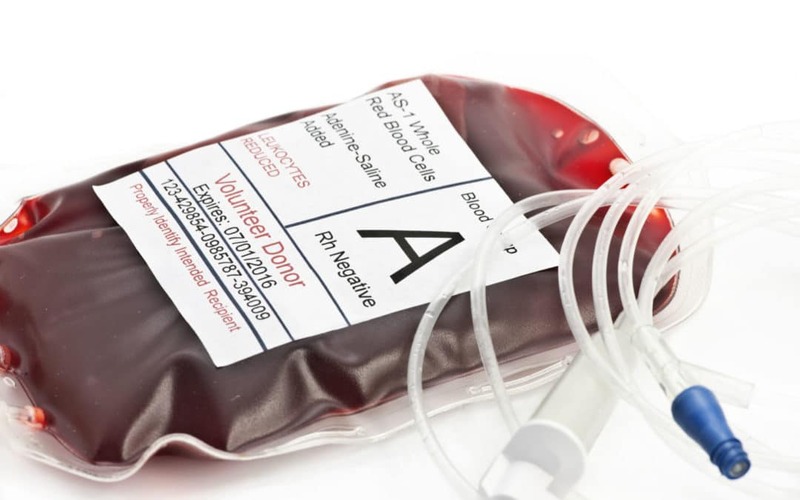 NHS Blood and Transplant department are continually looking to recruit more people with these rarer types of blood types as the closer the match the better the success rates when treating people. Blood is made up of several components, such as red blood cells, platelets and plasma. These can be used individually to treat many different conditions. Usually a blood donation is separated into individual components or parts, so a patient can be given the specific part they require. This gets the most of every blood donation, as the components in one unit of blood (or one donation) can be used to treat different patients and many different illnesses and conditions. Blood is a living tissue so it is perishable and needs handling with care. To maintain its life-saving properties, blood is stored in special nutrient solutions. Blood has a short shelf life which explains why the supply needs topping up with regular blood donations. Plasma is the largest single component of blood, and makes up about 55% of total blood volume. It is a clear, straw-coloured liquid, which carries platelets, red and white blood cells. It contains over 700 proteins and other substances which can be extracted and form the key ingredients in medical products. These products can be grouped into three main types: clotting or coagulation factors, albumin solutions and immunoglobulins. Clotting factors are proteins that work with platelets to clot blood which is known as coagulation. People need clotting factors so their blood can successfully clot. If anyone is missing one or more of these factors, it leads to blood clotting disorders such as haemophilia and Von Willebrand disease. In the UK, haemophilia is now commonly treated with ‘recombinant factors’ that are manufactured in a laboratory and don’t come from donated plasma. Other blood clotting disorders are treated with coagulation factors made from donated plasma. If the circulation is working properly, vital hormones, cells and enzymes are transported to the correct parts of the body to do their job. However, if it’s not working properly, the circulatory system starts to break down and there are serious consequences such as fluids being retained in the cells. Using a treatment with human albumin solution ensures the appropriate amount of fluid is circulating in the blood stream. Albumin can also be used to treat people with some types of liver or kidney disease and patients who have suffered burns. Immunoglobulins are protective antibodies produced by the body to fight against invading viruses or bacteria. There are two different types of immunoglobulins, specific and non-specific. Specific immunoglobulins contain high levels of antibody to a particular illness. Antidotes to tetanus, rabies, chickenpox and hepatitis are all examples of specific immunoglobulins. These are given to people who have been exposed to a specific infection. For example, a donor who has had chicken pox will have high levels of chicken pox antibodies. As a result their plasma would be ideal to treat a child with leukaemia who has been exposed to chickenpox. People with a faulty immune system need these products to live. It takes over 1,000 donations of plasma contribute to a single dose of an immunoglobulin product that contains all the necessary antibodies.